Performing keyword research is important for any website campaign. Taking your bias out of the keyword strategy is important just so you can make the best possible decisions every single time. One of the worst things you can do is write content for a lot of search terms that nobody is actually searching for. 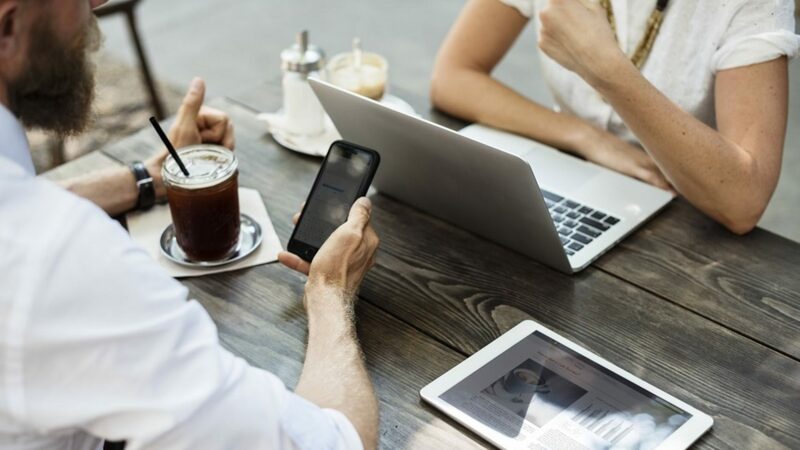 If you use this tool it will give you related searches and suggestions that can help guide you to focus your content on what users are actually searching for. 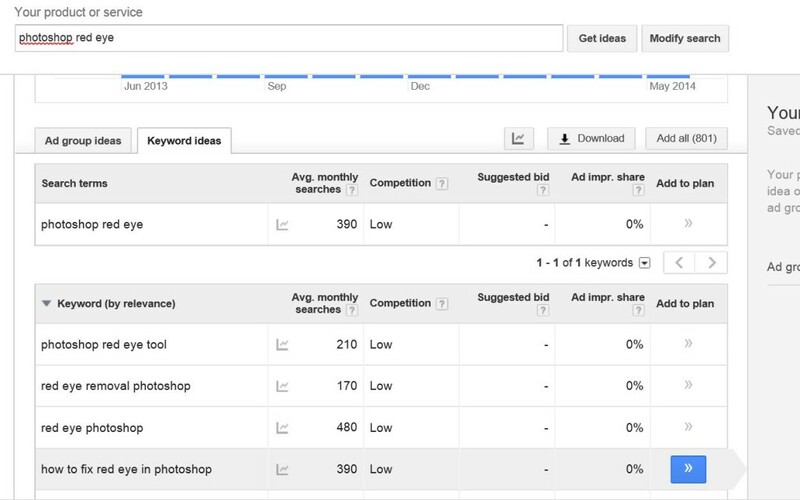 One great tool to perform keyword research is Google itself. Today we are going to learn how to use the Google keyword planner tool. 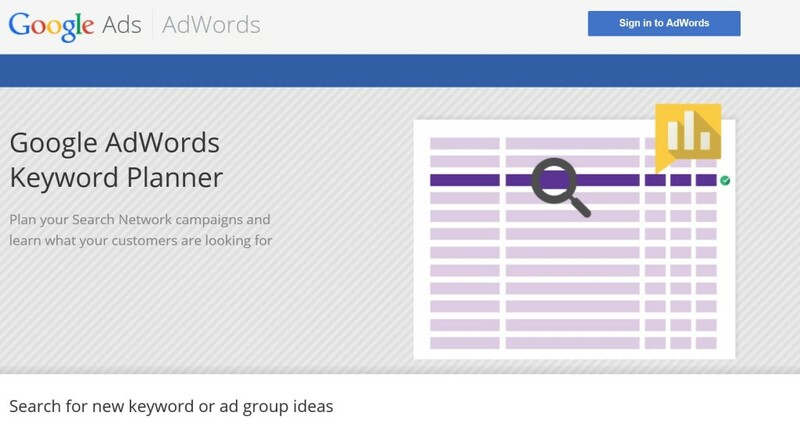 This keyword tool is completely free as long as you are able to log in with a gmail account. Once you sign in you will see something like this below. You can click on any of the tabs, but I generally just click on the top. The top option not only gives you the keyword that you looked up, but also related keywords which is just as important as you will be amazed as to what else is being searched for. This becomes important because this tool will let you see the search volume for a large list of related keywords. This works great for longer tail keywords as most of us today as longer questions in search to find our answer rather than just a search for something generic. Now we want to put in the keyword we want to track. This video tutorial used this search below. 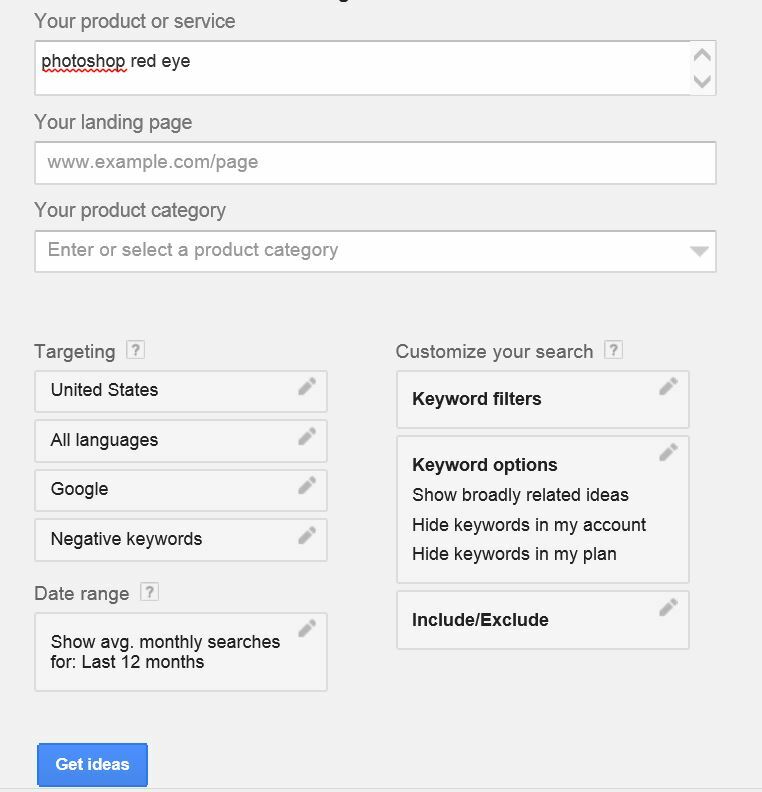 Right here I put the search term Photoshop red eye into the Google Keyword Planner Tool. I specified that I am only interested in the Unite States market. As a bonus hint do you notice the section that says negative keywords? This section will actually become powerful for you if you were going to start a pay per click campaign for your business. Essentially negative keywords are keywords that you don’t want to be found for. An example of why someone would want negative keywords would be if they were a museum that had a section of Samuel Adams in it. This museum wants to be found at the top of Google every time someone searches the term Samuel Adams. The problem is people could be searching for the beer company. If your site came up for the beer search a few things would happen. The first thing is that you are being found for a topic that you are not talking about. People who click on your link would immediately click back off. If you were paying money for that search you would be wasting money every time someone clicked on that link because they thought they would check out the beer company. The second thing is that Google will see this as a pogo stick effect. They will see a large number of searches that happen that go to your site. Those people who come to your site, then immediately left and went back to Google to refine their search. That is not good for Google as they just failed to deliver a great result. If that happens, Google could be more inclined to drop your listing in their results just because of the bad user experience your site has. Google would also then raise your price for PPC just because they want you to pay more if you are having a bad experience for their users. The way to get around this is to put the negative keyword search for beer or alcohol or company in the negative keyword section. This would essentially tell Google that if any of these searches happen that have these keyword searches to NOT show your site. This will save you money and make more of your clicks more qualified! Now we want to see what the data shows us. This graph is pretty interesting with the data. What you can do from here is sort by search volume, cost per click, or the relevance of the keyword. This will start to expand upon your keyword universe as you will start to see what are your target keywords. You will find keywords by doing this that you would of never thought of. These are generally the longer tail keywords. Normally I try and target about 3 keywords per page on my site. However, I might notice that there can be about 10 or so keywords that also would be great to rank for. This happened a lot to my clients when I worked in an SEO agency where they really had a focus on traffic. One way to optimize your page for more keywords is to have future blogs expand upon existing content and have that internally link back to that main page. That way you are writing a new and fresh blog about something a bit more specific (the long tail) yet, you are given a link for your users to learn a bit more (about the vague) topic or article you wrote. That way your users can learn something very specific about how doing one thing or they can learn more about the general stuff that you offer or showed. There are a lot of free keyword research tools out there, but I generally stick with Google as that has the largest market share of searches. Normally, if the keyword is highly searched on Google, chances are it is the same on Bing and Yahoo. However, it is still important to use other tools just to make sure the search volume is accurate / learn new keyword ideas. As a note the more generic terms with the most search volume will have the largest amount of competition. Everyone wants to rank for those terms because they can generate the most traffic back to your website. I would recommend creating a list in excel that breaks out the search volume for a few sections of keywords. I would categorize this list with a low, medium, and high. The high are the keywords that can generate the most amount of traffic back to your site. These will be the hardest to rank for. The medium is the keywords that are in the middle while the low keywords are keywords with less search volume but generally easier to rank for. If you start your process like this then this can allow you to see where you rank and what terms you should see go after further down the road.